Previewed at: Verona Cinema, Sydney, on 23 November 2017. If you have an Anglo-Celtic or Anglo-Saxon background and are of ‘a certain age’, then you almost certainly would have grown up listening to the adventures of Winnie the Pooh; I say “listening to” because they were probably read to you as bedtime stories rather than you reading them yourself. The stories were definitely aimed at the very young. 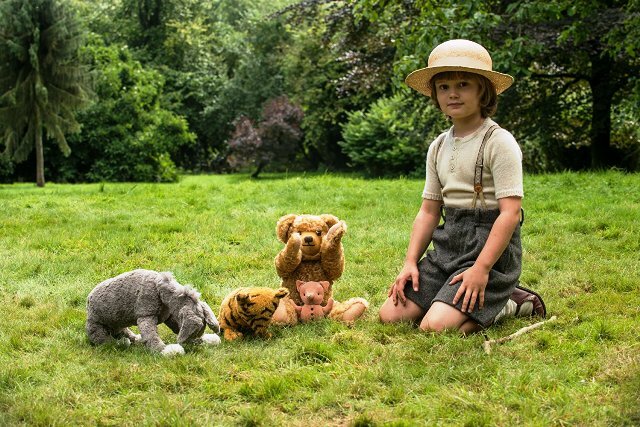 Goodbye Christopher Robin tells the story of how British author A. A. Milne came to write these delightful tales and how they came to be universally loved. It’s a tale of success and failure: the success of an author and the failure of a father. Alan Alexander Milne (Domhnall Gleeson) was already a successful and prolific author of plays, novels and screenplays in England in the first decades of the 20th century before he wrote, in 1926 and ‘28, what were to become his most famous works, Winnie-the-Pooh and The House at Pooh Corner. During WWI Milne served on the Western Front, where he was injured in the Battle of the Somme, and he spent the remainder of the war writing propaganda for Military Intelligence. In addition to his physical injuries, the film depicts him as suffering from what we would now recognise as PTSD. Needing peace and quiet, in 1925 he moved to East Sussex with his wife Daphne (Margot Robbie), five-year-old son Christopher Robin (the delightful Will Tilston), and the boy’s nanny Olive (Kelly MacDonald). While living there Milne was moved by the young lad’s innocence and imagination, and he wrote a poem about him, Vespers. When its publication was acclaimed by the British public he decided to expand on Christopher Robin’s universe, writing about his camaraderie with his teddy bear and his other stuffed toys, and the rest, as they say, is history. The books were wildly successful and Christopher Robin was trotted out to publicise them but fame took a toll on the family that they would pay for years afterwards. Simon Curtis, the director of Woman In Gold and My Week With Marilyn, has form with this kind of period material and he’s good at it; there’s a warmth to the film, even if Frank Cottrell Boyce and Simon Vaughan’s script is, in fact, a little grim. This was the time of the ‘stiff upper lip’, when affection wasn’t readily conveyed between parents and their offspring, especially in the so-called upper classes. Children were to be seen and not heard and emotions weren’t to be expressed; as Margot Robbie’s Daphne says to Christopher Robin, “There’ll be no crying in this house.” Gleeson perfectly captures the wounded, somewhat distant soul of Milne, and the always excellent Kelly MacDonald brings a real sense of being to her role as the nanny, the only source of affection in Christopher Robin’s young life. Margot Robbie’s character is not a sympathetic one and she’s underwritten; it’s hard to get a grip on Daphne’s motivation and, let’s face it, cruelty to her child. The star of the film, however, is nine-year-old Will Tilston - he steals every scene he’s in. Gleeson says of him, “He’s generous and he’s kind. He’s a very young person, but he’s got a good take on life and he’s nice to people. Will’s an incredible mix of things and I really enjoyed working with him.” These were the exact qualities needed for Christopher Robin, so perhaps it wasn’t too big a stretch for the lad. Goodbye Christopher Robin is a cautionary tale but not without charm. It’s something of a surprise too - if you think you’re going to see a slender little film about a delightful children’s book you’re going to get a shock. It’s much darker than its subject matter would lead you to expect.